We developed the Skeg Leg to enhance low speed and dead stick maneuvering and improved straight line travel in these Electric Deck Boats. They come standard on all Esc’ADE’s, Esc’KEY’s, Refurbished ElDeBo’s and Re-hulled Escape Cruz Boats. 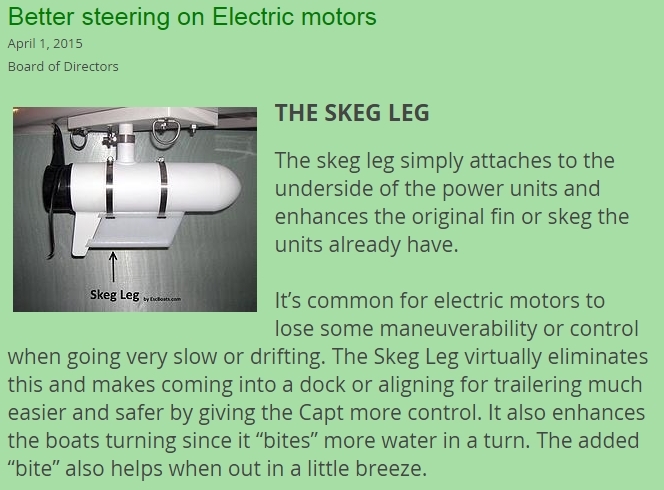 The Skeg Leg simply attaches to the underside of the power units and enhances the original fin or skeg the units already have. It’s common for electric motors to lose some maneuverability or control when going very slow or drifting. The Skeg Leg virtually eliminates this and makes coming into a dock or aligning for trailering much easier and safer by giving the Capt more control. It also enhances the boats turning since it “bites” more water in a turn. The added “bite” also helps when out in a little breeze. Also, our design does not interfere with a trolling motors outer surface to remain in direct contact with the surrounding water. It’s this direct water contact that cools the motors from damaging overheating. The SkegLeg’s components are very durable and will last a long time. The heavy duty, high torque stainless steel band clamps work great in water and the Skeg Leg itself is made from a very durable plastic prized in the marine industry and general manufacturing for it’s outstanding impact and wear resistance. Installation is very simple. A quick look at the picture and video will help greatly. Start by unscrewing the hose clamp screws until the banding comes free, insert the tag end of the clamps into the slots machined into the Skeg Leg, align so the tabs are positioned on the original skeg, align the screw clamp housings on the band clamps on top of the power unit, tighten down the hose clamps, done. Re-tightening after a couple of outings will pick up any slack the clamps develop from stretching and the system settling in. Another simple and easy to use product from EscBoats.com to help be the ‘KEY and ‘ADE to your Escape out on the water. !!!!! NOW AVAILABLE FOR MINN KOTA 112 lb !!!!! Currently available for the Minn Kota 25-45 lb, 46-70 lb, 80-100 lb, 112 lb and E-Drive Motors. or go to Our Store and place your order! “My wife helped me install the SkegLeg on SM (Escape Cruz) while it was in the water. Took a bit of effort being in the water but, all in all, the installation went well and we were able to do so as the instructions outlined. When we left to test the SkegLeg, I noticed a major improvement immediately. The steering wheel was more steady. Without the SkegLeg I was constantly turning the steering wheel back and forth slightly to hold a straight line. With the SL this type effort was ever so slight when it had to be done, not often, even when going slow or in a breeze. Turning was also much easier! Basically total handing of the Escape Cruz was much more responsive. Hooray! We would encourage anyone owning a Minn Kota electric trolling motor as on our Escape Cruz to purchase and install the SkegLeg. It will make driving the EC so much more fun. Has for me.